Make dipping sauce by combining dressing, mustard, vinegar, 1 teaspoon minced onion, the garlic, Worcestershire sauce and hot pepper sauce. Set aside. 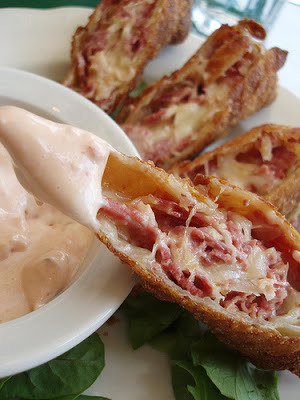 To make rolls: Combine corned beef, cheese, sauerkraut and remaining 1/4 cup onion and mix well. Place about 2 tablespoons of the mixture in the center of an egg roll wrapper. Roll up as directed on package, sealing edges with a little water. Deep-fry rolls in 2 to 3 inches of vegetable oil, heated to 325 to 350 degrees, until golden brown, about 3 to 4 minutes, turning to brown evenly. When done, remove from oil with slotted spoon and drain on paper towel. Serve with dipping sauce. Makes 12 to 15 rolls.